Shatter the Silence is the romantic and long-awaited sequel by New York Times Best-Selling Author Daleen Berry. 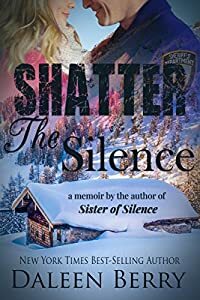 The sequel to Sister of Silence, Ms. Berry's 2011 breakout memoir about surviving abuse, Shatter the Silence takes place in Preston County, West Virginia. This romantic memoir weaves accounts of the true crimes Ms. Berry covered while working as a news reporter with details of her divorce, her ex-husband's ongoing harassment following their divorce, and finally, her love affair with the police detective who became first, a colleague, then a friend, and ultimately, the man who helped save her life. Readers will weep as they learn about the collateral damage Ms. Berry and her four children sustained, following ten years trapped in a violent marriage. They will cheer when they see her refusal to live the rest of her life as a victim, and will be overjoyed when Ms. Berry realizes she has, as a single mother of four at the age of 27, fallen in love for the very first time. Finally, Ms. Berry’s loyal fans will be moved by the tender, intimate moments she shares, as they join this award-winning author on her journey to love and healing.